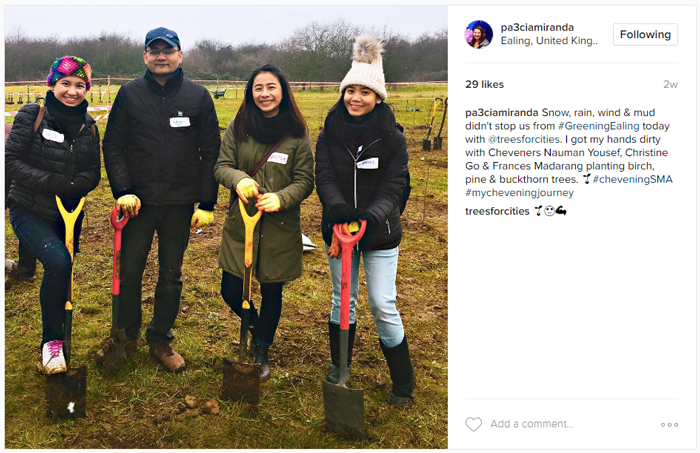 On Thursday, 11 February, Chevening Scholars joined hundreds of volunteers to help Trees for Cities plant thousands of trees at Marnham Fields in the London borough of Ealing. The aim of the event was to create an edible urban woodland that will provide a welcoming habitat for the endangered stag beetle, reduce pollution impacts from the A40 highway, and provide more green spaces for the community. The day began with the Trees for Cities coordinators and staff giving us an in-depth briefing on how to properly plant the saplings with the goal of planting 20,000 trees. We all then put on our special safety gloves, picked up our spades, and earnestly got to work. It was good to touch base with Frances Madarang, a fellow Filipino Chevener, who introduced me to Christine Go, an Indonesian Chevener from the University of Reading. We worked as a trio at the edge of our assigned space and helped each other in digging a wide planting hole, gently placing the sapling of our choice, and carefully backfilling the hole. It was a bit of a challenge as the ground was a bit frozen. Nevertheless, the snow and rain did not stop us from getting our hands dirty and our clothes muddy from planting crab-apple, birch, pine, and buckthorn. Khasif Ghani, a student at the London School of Economics, said that he was ‘freezing, but it felt good to be part of such a large and impactful community event’. Indeed, it was such a rewarding experience to see the saplings neatly lined up in rows. As you can see, we were all smiles knowing that we worked hard for a good cause that day. 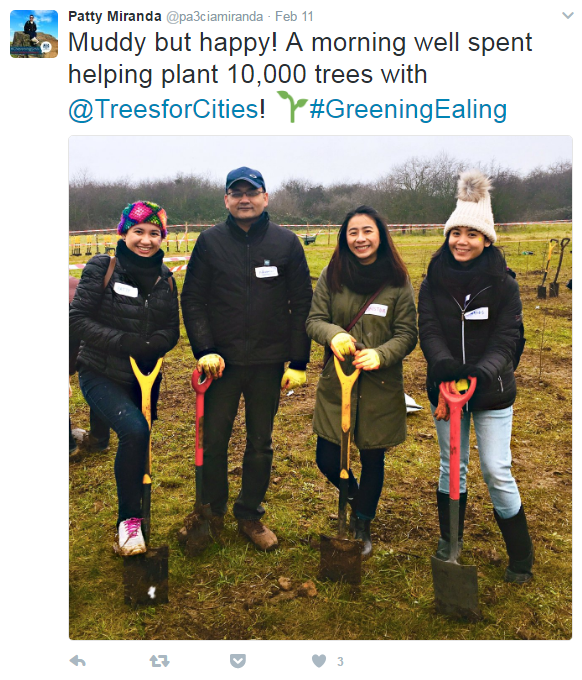 Nauman Yousef, student at SOAS University of London, said that the part he enjoyed the most was ‘meeting people and enjoying the snowfall’ as he planted hazel and cherry trees. Volunteering for this event made me reflect on the importance of urban planning to promote human and environmental health. The stewardship of green spaces should be a priority of all cities, and it is a lesson I look forward to bringing back home to the Philippines.